This Almost Everything BOGO, Buy 3 Get 3 Free Sign Arm hosts an impressive offer with only a minor limitation. Do see that its “Almost” everything not “Absolutely” everything. Generally, the fine print conditions are expansive and even extend to ear piercings … though that item is difficult to buy in 3’s. Do check with a Sales Associate. 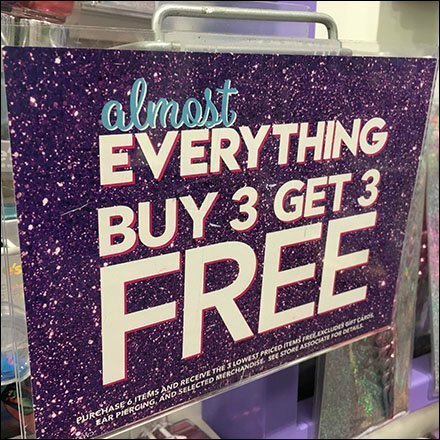 This Almost Everything BOGO, Buy 3 Get 3 Free Sign Arm see at Claire’s.